Does anyone have a cutting table like this? If you do, did you make it or purchase it. We are building a new home with a sewing room and thought this would be ideal, could make it with a Formica top to match sewing counter. Can anyone help me? Thanks for any info. No photo to comment on. I think she is wondering if there is such a piece, and do you own it and what is your opinion. Sort of sounds like the desk that the CEO of 'Duck Dynasty' gave his employees so they could stand up and work, because he read the employees would work better standing up! 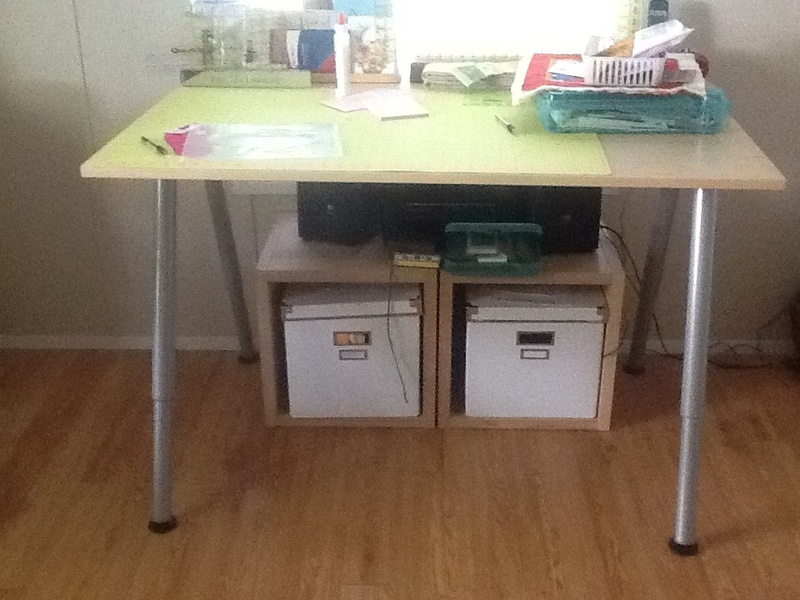 Want to use this table while sitting or standing and in different areas of the sewing room. How about this - it's expensive though. I bought this table at IKEA. The height was just right at 36 inches high, so I bought casters that are 4 inches, and cut 4 inches off the legs. It has nice big drawers too. My friend has two kitchen counter height kitchen cabinet with drawers and doors back to back to make a large cutting table. It wouldn't fit in my sewing room but I wish it would!!!! I want to make myself a cutting table for my new (future) sewing room. I do want mine on casters but the adjustable height sounds like a tall order (no pun intended). I found a nice plan in a book called The Hand Built Home. I'll be using one of our old kitchen base cabinets-about 5' long by 24" wide-for an ironing table plus there will be space for storing my ironing goodies and other stuff. It'll have 6 drawers and 2 doors. I cannot wait. I did see a height-adjustable cutting table in a private home recently, but I didn't notice how it worked. It had been made by the owner's brother. I have one of the folding tables like JoAnns sells that I use for my cutting table. It has casters. Is not adjustable. I want hubby to make it adjustable for me (or really, just even shorten it). Could be done relatively easily by putting the casters on either wood or metal legs that are of a slightly smaller dimension than the original table legs (assuming those tubes are hollow - and I think on this one they are). Then drill holes in various positions on each leg/support and use a long bolt/pin to secure them at the height you want. Now if I can move that project to a higher priority level on either my or DH's 'to do' list, I'd have it made! At Office Max we cruised the furniture dept. Reminded me that architects tables used to be adjustable. What I think of to make height adjustable is hydralics or telescoping. I bought a Martelli table at a show. (The show prices are better than the online prices.) It is by far one of my favorite purchases of all time! It adjusts height with the touch of a button. It will also tilt. The casters are large and have a locking feature. I was able to move the table from room to room after having shoulder surgery. The cutting board is recessed into the table. I also use the table to baste my quilts and move it over beside the sewing machine to hold the quillt off of the floor as I'm free-motion quilting. It's made by a U.S. company, and their customer service is exceptional. I'm a fan of their other products too. See if you can get on their mailing list. They have sales regularly through email. I got a table at Sam's Club that folds in half for storage and has three adjustable heights. It is very sturdy and not all that expensive - $30-$40 range if I remember correctly. To add more height variations I just use pieces of 2X6 under each leg. When I sandwich a quilt for example I want it higher than when I am cutting etc. I don't need to move mine around so casters are not necessary but if you did want to move this table it would be easy because it doesn't weigh that much. We bought the table top at IKEA and the adjustable legs were in that same section. I've really enjoyed using it. It's very sturdy. There are quite a few different tops and styles of legs. I can't remember how much we paid, but it didn't break the bank. :-) IKEA has an online catalog, I believe. We drove 2 hours, because I generally have to see things that I'm going to use forever. Happy shopping,and share what you decide, okay? you could always get the fold up adjustable leg table at Sams or Lowe's. I have one for my cutting table and when I am through I just fold it up and slide it behind my sewing machine. It is 4 ft long and it folds in half. The legs adjust to about 31 in high and my friend sets hers so she can sit on the sofa and use hers. Works great and cost around $37.00. I just got back from a quilting show where they were demonstrating one. It was pricey, so I didn't even get a card from them, but it is on my lottery winnings list if I ever win the lottery. Theirs was about 3'x4', electric, adjustable height AND tilt, so you could use it for cutting or sewing AND thread your machine without straining your neck. It also came with full size cutting board and rulers. You have to buy the table top (many sizes to choose from, very cheap price) and the legs seperatly. The adjustable legs were 15.00 per leg and screwed up and down to change height. Not something you would do twice a day I can tell you. The standard legs were 3.00 a piece, I opted for the 3.00 leg and DH cut them down as I don't have a need for it to go up and down. Michael's, JoAnns and other places sell "risers" which are about 6-8 inches tall, with ridges on the top to keep table legs in them. Set your table legs on these and now you have a raised table. I've seen others who stick the legs of the folding tables into PVC pipes which are cut to the desired height. I like the risers because they are easy to put on and off, so you can have the table for stand-up or sit-down use, whatever. I saw the Martelli table at a show. I SO WANTED THIS TABLE!!! But I would have to invade my husbands space for it so without him there to show him how he could use it too, I didn't get it. It kinda depends on if you want a cutting table that you can move or something more permanent. I like the table from Ikea suggested above. I would buy 2 and place them back to back to make a large square cutting table. Lots of storage underneath. You could add casters to make it moveable or higher. I have 2 counters that were made for a store. They were made in the wrong color, so I got them for $175 total. THey are really sturdy and have lots of storage. They are 24"x48", so with them back to back I have a 4ft square cutting table. I have a cutting mat that covers most of it. If I could keep the junk off of it it is an awesome cutting table. It is the right height to stand at, tons of storage underneath to hide my stash. I have a horn table which can also be flipped to get out of the way. I have the same Ikea table as coopah. I keep my big embroidery/sewing machine on it. I adjusted the height to what I wanted. It doesn't accomodate wheels though. However, I have tile floors and it moves easily over tile or wood. Ikea does have straight legs that accomocate locking wheels. I do have a wheeled [locking wheels] kitchen cart that is the right height for me that I use for my cutting table. If I had more space I would go with kitchen cabinert bases to my height - two of them back to back - and would have them stationary.